Guy Adams, one of the team behind Rafty McRaftface, talks you through how they made it. The main frame of the raft is upcycled from a kids’ climbing frame/construction kit call Quadro (see Quadroplay). I played with this as a child and bought a couple of sets second hand 6 years ago to build with my kids. When we are not rafting the frame is remade into a slide or house. I have considered rebuilding the frame out of 2x4 and strip wood which would actually add a fair amount of stiffness and reduce weight - the plastic is amazingly heavy and with all the jointed sections it has rather a lot of flex over the very long length (we made sure we build right up to a few cm shorter than the max length - the longer the length the smaller draft of the raft in the water for a given weight and therefore the smaller cross section we have to push through the water). We used plastic panels from this kit to make somewhere to put our feet and (when covered with a bit of foam matting the kids used to play on) to make seats. ​The back section of each pontoon is made of scrap mild steel round bar offcuts I had in the garage left over from other projects. They were just hand bent to the right shape and tack welded and then wrapped in duct tape. The front section is made from a couple of bits of 2x4, some thin strip wood and some fibre board - all of which are just bits from my garage. 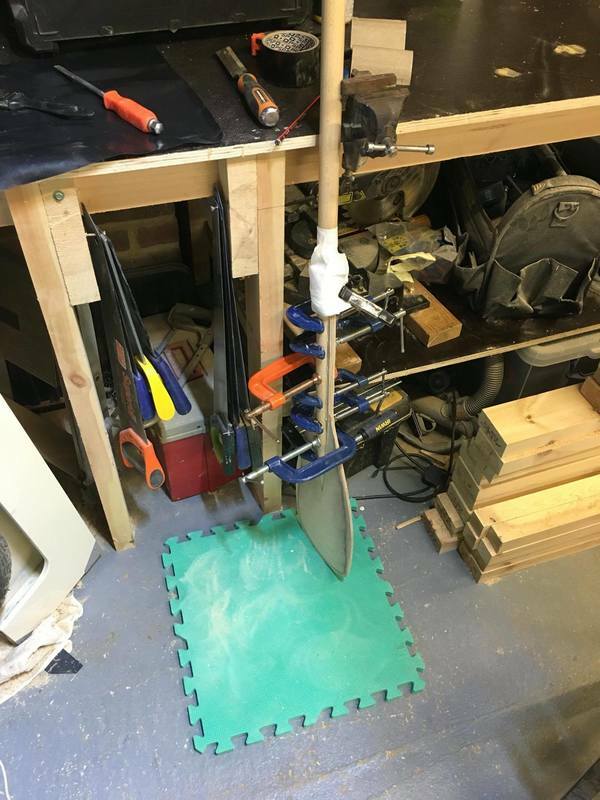 The strip wood was just soaked in hot water (to make them a bit easier to bend without snapping), bent and clamped to shape and then glued and screwed. The first year the skin was made from a black plastic pond liner sheet from an abandoned project which worked fine but tore very easily and needed a few layers to give protection. Last year we replaced it with a PVC mesh fabric of the sort used in bouncy castles and tarpaulins - available from many places - I got mine from eBay. It's secured with eyelets punched into the skin and they just laced up like a shoe with string (and the old cable tie where this doesn't work). The really time consuming and fiddly bit here was to cut and glue the prow section to fit well over the wooden frame and be water tight. This took several failed attempts. It was such a pain I gave up trying to do the back the same - the back is just gathered up and tied at the top with a cable tie - not as hydrodynamic as it could be but 'good enough'. The skin is really the only change from our first year to last year (we did also change the shape of the prow a bit to reduce the 'seesawing' we paddled we saw when we reviewed video from previous years). The paddles are 100% home made from scrap I had lying around. These are made from 9mm plywood, broom handles/garden implement handles (you will note that the handles are different sizes and thicknesses since they were stolen from different old brooms, spades etc and sanded smooth). 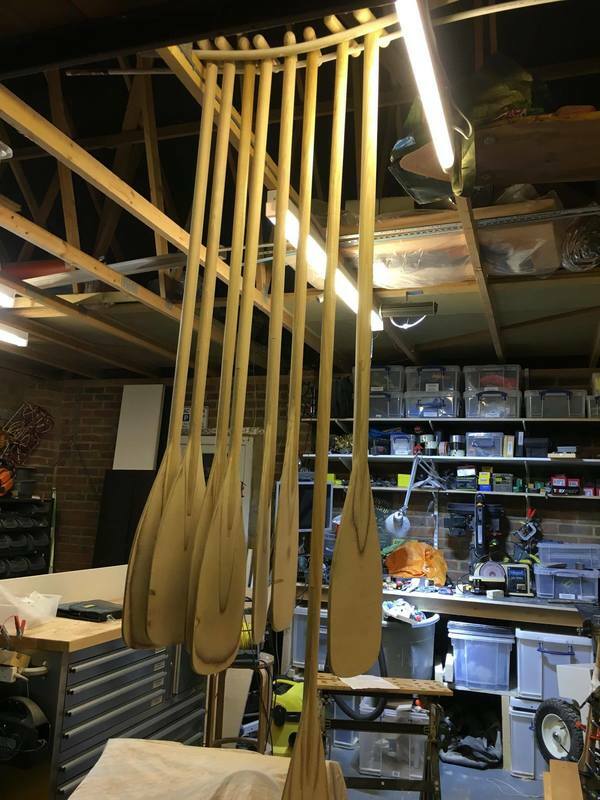 The paddles had a 9mm channel routed into them up about a third of their length and the blade blanks (just hand drawn and cut out with a jig saw) were inserted into these channels and glued. Once the glue was dry the rest of the blade shape (especially thinning towards the edge to reduce weight) was done with a belt sander. The t-piece at the top was made simply by cutting off 4 or 5 inches of the length, shaping on the belt sander and glued and screwed to the top. They were finished with 3 or 4 coats of yacht varnish to water proof them. 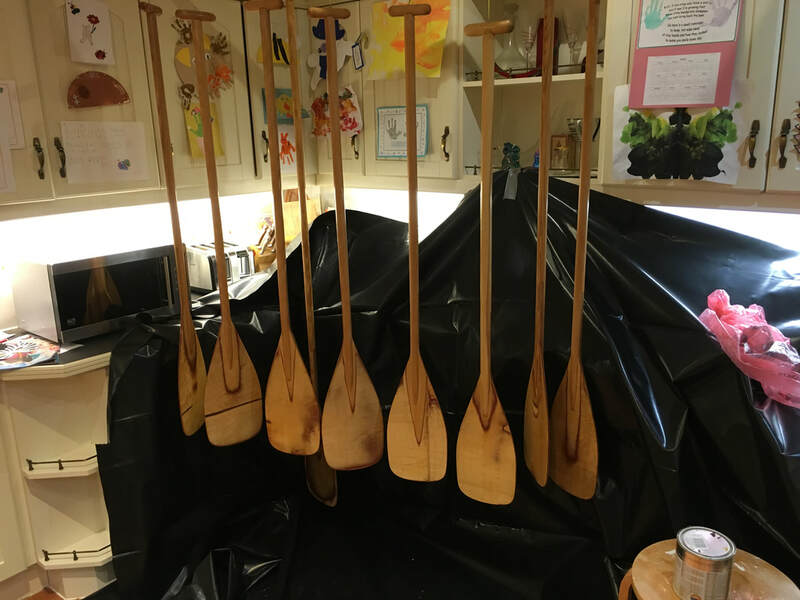 I've attached photos showing one of the paddles under construction and a couple showing them being varnished.